As I reported and wrote, the story changed rapidly; by the time my article about the Gezi Park protests was published, much of Istanbul (and then other cities around Turkey) had erupted into mass demonstrations, with protesters clashing with police late into the night. After a fragile peace was restored in Taksim Square and Gezi Park, I wrote a follow-up piece about the Occupy-style "mini-city" created by protesters, complete with libraries, food tents, and infirmaries. As the Gezi Park protests drew renewed international attention to Turkey, multiple guest-blogging offers came my way. I wrote two posts for TreeHugger.com, where I previously served as Istanbul correspondent: on how the nationwide demonstrations started with a local effort to defend a park, and on some of the other environmental threats facing Turkey and the risk of a damaging "nature" law being pushed through the Turkish Parliament while all eyes were elsewhere. I also spoke live to CTV News Channel in Toronto about the mood in Istanbul following a promise to put the fate of Gezi Park up to a referendum. 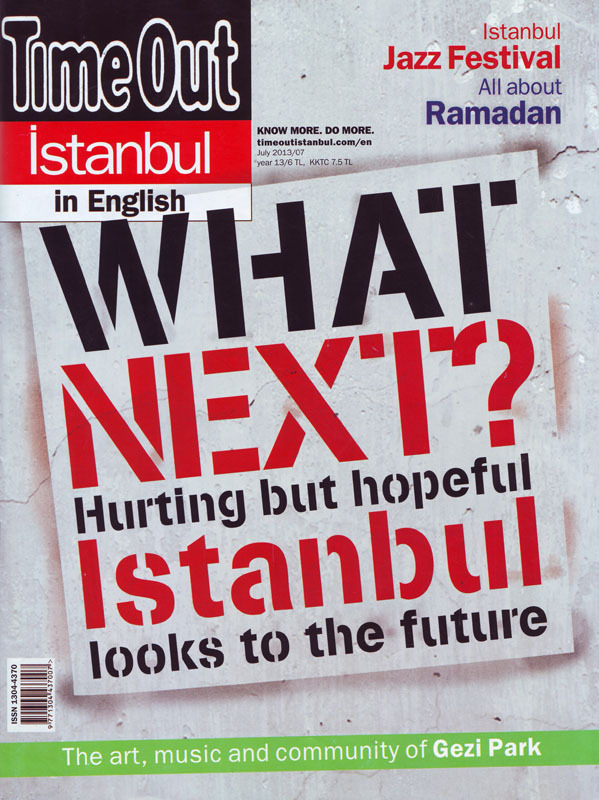 With the protests continuing at full force well into June, there was only one choice for the cover story of the July 2013 issue of Time Out Istanbul, the monthly magazine I was editing at the time. 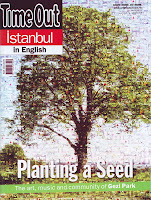 I commissioned stories about the music inspired by the protests, the street art both humorous and biting that was popping up everywhere, the free public library that was created, the role of Istanbul's LGBT community in the demonstrations, and a personal essay by a Turkish author about her time in the Gezi Park community. I also wrote a piece on the "urban transformation" of Istanbul, one of the sparks of the unrest, as well as one on three documentary films that foreshadowed the upheaval. I also co-wrote a piece on the political and social context behind the protests that was eventually pulled amid fears of government retribution. Living just a few blocks from the protest epicenter, I had some of my own experiences and observations to share too. 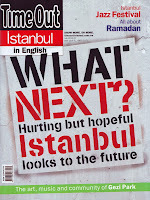 On my personal blog, The Turkish Life, I wrote about the rapidly changing scene in Taksim Square during the early days of the protests; the spontaneous pedestrianization of the area; and the aftermath of the forceful clearing of Gezi Park. The biggest hit among these posts, though, was my guide to the language of the protests, from "AVM" to "zıpla." With so many factors at play in the recent unrest, understanding the debates and divisions fueling dissent in Turkey requires a bit of a trip back into history, specifically the mere 90 years that have passed since the forming of the Turkish Republic. Faced with the crumbling remnants of the Ottoman Empire following World War I, first Turkish President Mustafa Kemal Atatürk – still an omnipresent figure memorialized in currency, on statues and through imagery all over Turkey – established his new country on a nationalist, secular foundation. The overarching identity of “Turkishness” is still a strong one today but deep fissures remain – between religious and secular individuals and between Turks and members of the Kurdish ethnic group, to name just two of the most fraught divisions. Erdoğan, the current prime minister, was a member of Erbakan’s Welfare Party. When the Justice and Development Party (AKP) he later helped found swept to victory in the 2002 elections, it was as a conservative democratic party that advocated a liberal market economy, stronger ties with the West (including Turkish membership in the European Union) and an end to corruption. When AKP won its third national victory in 2011, Erdoğan promised to seek to consensus on major issues and work for the entire population, not just his supporters – something critics now charge that he has glaringly failed to do. In Turkey’s parliamentary representative democracy, the prime minister holds executive power, and the presidency is considered a largely ceremonial role. A Council of Ministers advises the prime minister, who is the head of the party that wins the most seats in Parliament in a popular vote. What this all means in practice is a system heavily weighted toward top-down control, with few avenues for citizens to communicate their concerns to elected officials. Marches such as those held on İstiklal Caddesi on any given weekend have become a key way to people to try and make their voice heard. Anger has also been growing over Erdoğan’s harsh crackdowns on press freedom – Turkey is now the world's worst jailer of journalists, according to research by the international Committee to Protect Journalists – and reprisals against critics in the media and business worlds, as well as what appears to many to be an increasingly Islamist bent. Erdoğan’s party has removed longstanding restrictions on the wearing of the Islamic headscarf while recently adopting new limits on where, when and how alcoholic beverages can be advertised and sold. The prime minister himself has called repeatedly for Turkish women to have at least three children, decried abortion as “murder” and voiced his wish to raise a “pious generation” in Turkey – all aspects of what are seen by his critics as undue interference in people’s individual lifestyles. In some ways, too, the AKP has been a victim of its own success – the Turkish youth growing up in the stronger, more prosperous country the party has helped create have higher expectations from government and demand more of a voice. While the protests have largely been directed toward the government, there have also been waves of discontent expressed against Turkish media networks, which were slow to cover the demonstrations, likely due to the ties many have to the government, and to the way Turkish officials have used financial and political pressure to influence news coverage.